Do you feel passionate about the refugee crisis? Do you have the right experience, values and skills? If so, we cannot wait to get to know you and truly value your efforts to help us get to know you better. Volunteering with PH4K (Project Hope 4 Kids) means that you are up for a challenge. The job is intense but so much worth it. As a PH4K volunteer you can make a lasting impact in the lives of many children and families which is worth all of your energy and efforts. By spending time together and learning new (language) skills you will notice that their self-confidence grows; something that you will feel great about. You will get to see so many thankfulness and smiling faces and will learn so much about different cultures in a very short time. You will both inspire and be inspired. PH4K has been in Filippiada refugee camp since the start of the camp which is why we know most of the children and their parents and why PH4K volunteers are so warmly welcomed by everyone. You are enthusiastic, energetic, keen on working with both children and adults and you have a passion for working with children who are affected by war: refugees living in the Eprius region in Greece. Preferably you have teaching experience and experience in one or more non-governmental organizations. This can be relevant academic background (e.g. psychology, pedagogy, community development, social sciences or international relations) or diploma’s and/or certificates. You are stress-resilient and able to deal with complex problems and changing situations and schedules. You are both a team player as well as able to work independently. You take pride in working for PH4K and are willing to financially support the organization by doing one-time fundraising before arrival (for example through organizing an event or participating with a sports event for example). 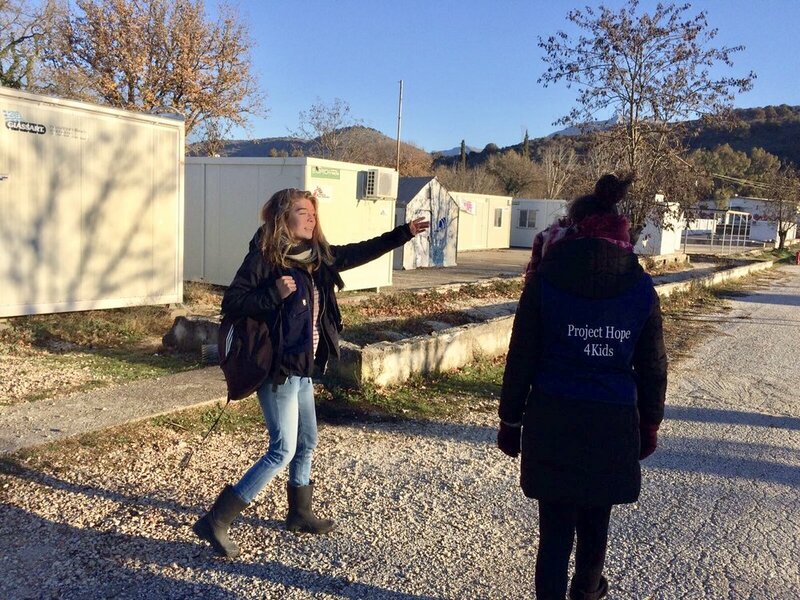 Project Hope 4 Kids (PH4K) is an American, Non-Governmental Organisation, providing non-formal education (NFE) to refugees (children and adults) in the North of Greece (Epirus). Moreover, it provides sport, arts, and crafts activities. PH4K is small but has big ambitions: currently we work hard to expand and start projects in different sites in and around Ioannina, which is the capital of the Epirus region we are currently persent. PH4K started its activities on Filippiada site since June 2016 showing that we value sustainability, consistency and trust for the children and the community in this ever-changing environment. First, the community consisted mainly out Syrian and Afghan people, but currently the majority is Afghan and Kurdish. With our classes we aim to provide the children a safe place where they can learn and play, where they do not need to experience feelings of fear and anxiety, but feelings of proudness and achievement. The art and sport workshops are to provide a place where they can make new friends, and create arts and use their imaginations which can be both healing and extremely educational as well. We want every child to have the best chance for success and an easy integration into the country in which they will end-up. We believe wholeheartedly that everyone deserves the right to peace, safety, freedom and the right to an education. The worldwide humanitarian organisations are taught to supply and meet the demands of Shelter, Food and Water first, just as it should be. But when it comes to child refugees, education is as important as shelter and clean water for these children. Project Hope 4 Kids aims to change that. We know the importance of bridging the gap between being out of school permanently and helping them to prepare to transition into full time formal education programmes. Not only in terms of knowledge but also in terms of reminding them about basic norms and values, and discipline in the classroom.